We’re here to take the fuss out of hosting so you can focus on the fun. Choose dishes from our catering menu below for delivery to your door. We’ve got chicken skewers and wings, our crowd-pleasing Thai style beef, fried chicken buns and more. Give us a call (202 733 5131) or send an email to jennifer@doimoidc.com to place your catering order today. 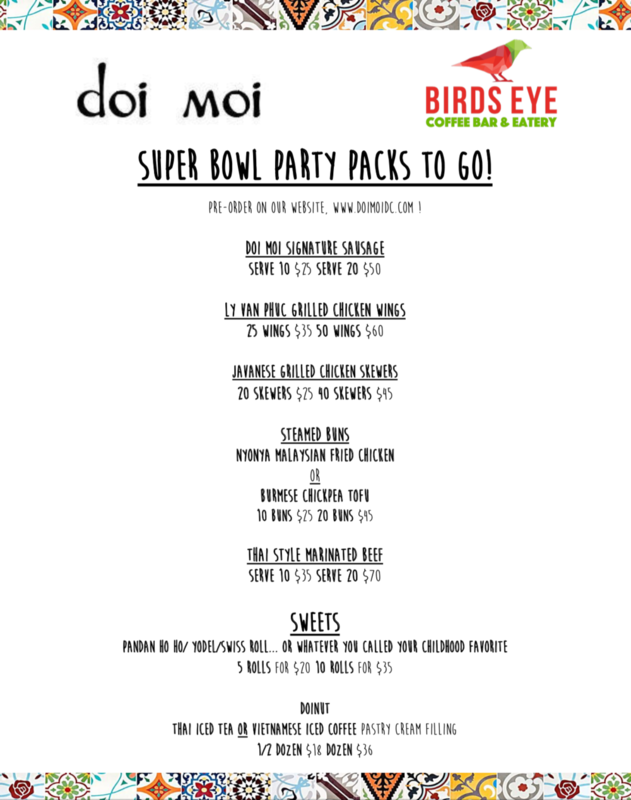 Our full Birds Eye menu will be available 8am to 6pm this Sunday, 2/3. We will also have Super Bowl specials available between 11am and 6pm. Come on in or order via Caviar to your door. Please note that Doi Moi will be closed that evening.